March | 2008 | "Self-plagiarism is style"
The Guardian article about celebrity liar and all round Walter Mitty type Robert Irvine made for some chucklesome reading at lunch time today. 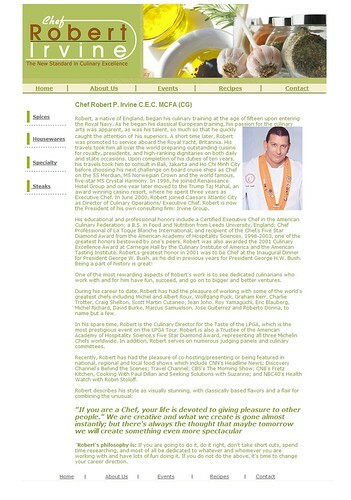 I’m also intrigued by the disclaimer on his home page which reads “The site is not affiliated with Robert.com”. So, to save any confusion, I’d like to take the opportunity to say that this site is not affiliated with Dave.com, Davey.com, DP.com, or WaveyDavey.co.uk. However, I would like you all to start referring to me as “Sir Dave of Huddersfield”.